When it comes to arthritis relief for dogs, there are several options. Some are good and some are not so good. Read on to discover a solution that more and more dog lovers are using with great success. Arthritis is a degenerative joint condition that is characterized by stiffness and pain. Over time, the cartilage in your dog’s joints will wear away, resulting in bone-on-bone grinding whenever your pet moves. This condition is very painful and can diminish your dog’s quality of life if not managed properly. Arthritis is found in nearly every senior dog, so understanding the signs of arthritis is important for proper pain management and care. Limping: in the morning or after a long nap, dogs are most likely to limp or favor one leg. As they become more active, increased blood circulation improves mobility. Difficulty/Resistance to Movement: Your dog may no longer attempt to do things he or she once enjoyed, such as jumping into the car or onto the couch. Abnormal Posture: Arthritis can also affect the spine, causing your dog to hold him or herself with a different posture, such as an arched back or crooked neck. Fatigue: Many animals manage their pain by sleeping more frequently. Aggression: Dogs that are in pain can act aggressively towards other animals or humans, particularly when painful areas are touched. 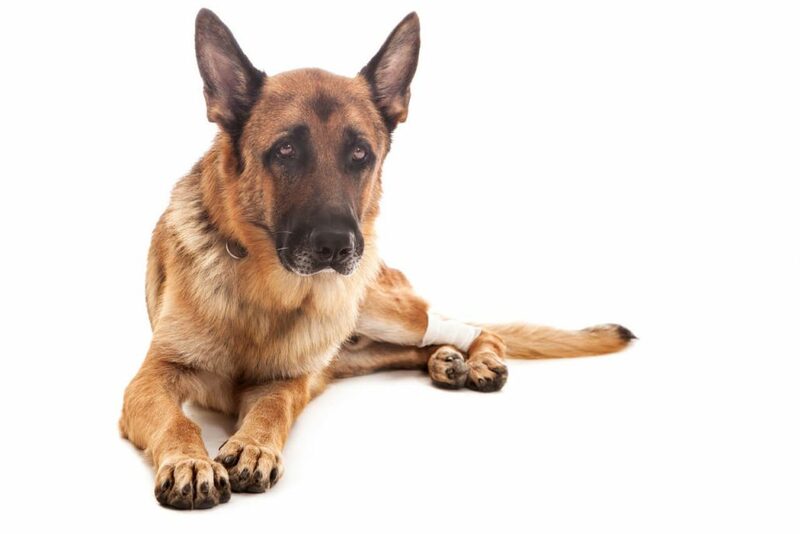 Muscle Atrophy: Dogs that have painful arthritis will spend less time on their feet, resulting in weakened muscles. One sign of this condition is legs that appear much skinnier than those of a normal dog. Excessive Licking/Chewing: Your dog’s natural tendency is to lick and chew at areas that are painful. If your pet is constantly licking or chewing on a particular joint to the point of inflamed skin and hair loss, your dog is likely experiencing considerable pain. Weight Gain: If your dog is unable to engage in normal exercise, he or she is likely to gain weight. This increased weight can put even more stress and pain on an already inflamed joint. Decreased Appetite: Pain reduces the appetite of even the most ravenous dogs. Fortunately, many dog pain relief options exist for our pets. Here are some commonly asked questions regarding pain relief for an arthritic dog. Oftentimes, a pet owner’s first instinct is to turn to human pain meds for dogs. While some human pain medications are safe in small doses, others can be dangerous. Ultimately, pain medications that are specifically formulated for dogs and are made from natural ingredients are the safest options. Ibuprofen for dogs is extremely toxic. Pain relief medications that contain ibuprofen include Advil, Midol, Motrin, Aleve, and certain aspirins. Symptoms of ibuprofen toxicity include vomiting, diarrhea, internal bleeding, nausea, loss of appetite, weight loss, increased thirst and urination, lack of urine, seizures, coma, and death. Advil for dogs is not recommended because of the possibility of severe, life-threatening side effects. As mentioned above, Advil contains ibuprofen, which is toxic for pets, even in small amounts. Aspirin for dogs is not recommended for long term use; however, it can be given for short-term pain relief, provided that you first consult a veterinarian. A generally accepted aspirin dose for dogs is 5 mg of aspirin per 1 lb of your dog’s body weight. This dosage can be given twice per day. When giving dogs aspirin always administer the pills on a full stomach. A common side effect is internal bleeding, which can be mitigated with baby aspirin, as it is gentler on sensitive stomachs. Always make sure the aspirin does not contain ibuprofen. Is There a Natural Anti Inflammatory for Dogs? Natural pain relief for dogs is the best option in order to minimize the risk of serious side effects while also providing effective pain relief for your pet. Even veterinarian-prescribed arthritis medications and steroids that are considered “safe” for pets can cause problems such as vomiting, diarrhea, constipation, fluid retention, ulcers, diabetes, glaucoma, high blood pressure, and kidney or liver failure. Fortunately, there are natural, side-effect free options. We found the following natural anti-inflammatory supplements for dogs to be highly effective and naturally safe for your pet. Use them both together and you’ll soon see your dog active, playful and pain-free once again! 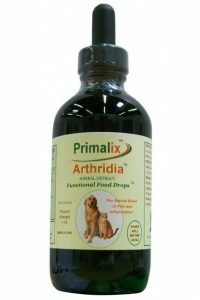 Primalix Arthridia is a dietary supplement that provides natural pain relief for dogs while reducing inflammation. This product contains scientifically proven herbs, such as Rehmannia Root, Bupleurum Root, Sarsaparilla Root, and Ginger to improve your dog’s health and wellbeing. The main ingredient, Rehmannia Root, has origins in Traditional Chinese Medicine, and in clinical Western medicine has been used for treating autoimmune disorders such as Lupus, Rheumatoid Arthritis, and Fibromyalgia. Rehmannia Root has been shown to reduce inflammation via modulation of astrocytes, which are immune system cells. Additionally, Rehmannia Root stimulates the production of adrenal cortical hormones, which act quickly to reduce both pain and inflammation. Other ingredients in this supplement have been proven for the reduction of pain and inflammation. Depending on the dog’s size, pets should receive ½ dropper to 3 droppers full of Primalix Arthridia twice daily. Read more about Primalix Arthridia. 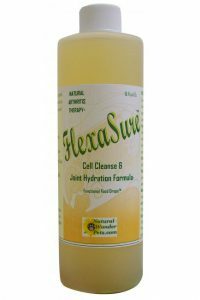 In addition to Primalix Arthridia, FlexaSure Cell Cleanse & Joint Hydration Formula is a nutritional supplement that is readily consumed by dogs for natural pain relief and joint repair. The main ingredient in FlexaSure is methylsulfonylmethane (MSM), which is the same compound found in glucosamine and chondroitin. However, whereas traditional supplements deliver 250 – 500 mg of this safe ingredient to your dog’s joints, FlexaSure delivers 1000 mg of this beneficial ingredient in a more bio-available form. Research from the Oregon Health Sciences University showed that MSM can rejuvenate tissue cells, restore collagen, rebuild healthy cartilage, and can permeate cell walls for the removal of metabolic waste products, such as lactic acid. Other active ingredients include the anti-arthritic herb, Chinese Skullcap, and hyaluronic acid, an important protein component of connective tissue. Hyaluronic acid fills up the space between cells in the connective tissues and provides the cushioning that allows joints to bend and flex. Ultimately, human medications for pain relief in arthritic pets can be dangerous. The use of a natural anti-inflammatory is the recommended solution since they are highly effective and naturally free of dangerous side effects. If your dog is suffering from arthritis pain, you owe it to yourself and your pet to give Primalix Arthridia and Flexasure Cell Cleanse & Joint Hydration a try today.